Updated: Feb. 13, 2017 2:37 p.m. | Sept. 14, 2016 4:05 p.m. Announced in 2014, the project would transport approximately 470,000 barrels per day of sweet crude oil produced in North Dakota. The proposed route travels through the Dakotas and Iowa (near Minnesota's southwest corner) to an existing pipeline in Patoka, Ill. The project, owned by Dallas-based Energy Transfer Partners, would cost approximately $3.8 billion. Permits for the project were approved by the U.S. Army Corps of Engineers in July, 2016. 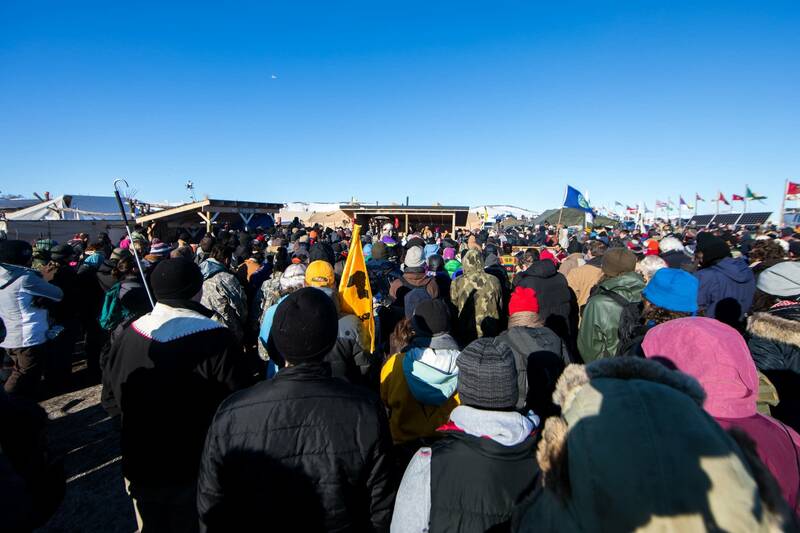 On Dec. 4, 2016, with protests deepening and harsh winter weather setting in, the Corps announced it would not grant a key easement, effectively stopping pipeline construction. On Jan. 24, 2017, however, newly elected President Donald Trump moved to advance the pipeline, ordering the Corps to speed up their review and grant permission to continue construction. Energy Transfer Partners has resumed construction on the project after the Corps granted them formal permission Feb. 8. Why was the route of the pipeline changed? The Dakota Access Pipeline was originally proposed to run about 10 miles north of Bismarck, N.D., crossing the Missouri River. This route was rejected in the Corps' environmental assessment due to its close proximity to public drinking water sources, multiple conservation easements and residential areas — the North Dakota Public Service Commission has a 500-foot residential buffer requirement. The alternate path still crossed the Missouri River — which the study deemed unavoidable — and ran south of Bismarck, crossing mostly private land and federal waterways including a segment under Lake Oahe, just over a half mile north of the Standing Rock Sioux Tribe Reservation's border — upstream from water intake structures the tribe uses for drinking water. The study said the proposed alternative was chosen because it "minimizes impacts on sensitive resources." The Corps' position changed Dec. 4, when federal officials announced that alternate routes needed to be considered. However, after an order from President Trump the Army Corps granted formal permission to continue construction. The change in route from above Bismarck prompted a lawsuit filed by the environmental group Earthjustice on behalf of the tribe in July. The suit claims that the Corps violated several federal laws when it granted permits for the pipeline's construction. Tribes say the pipeline poses the same risks to their drinking water as it did in the original proposal slated for north of Bismarck. They also say the pipeline would destroy areas of cultural significance and that tribes were not properly consulted before the project was approved. A letter sent to President Barack Obama in August, penned by different tribal and environmental organizations, mirrors the suit's claims that the permits used to approve the pipeline were intended for use on smaller projects with minimal environmental impact, such as boat docks and mooring buoys. A federal judge halted construction on the pipeline section on Sept. 7, after an emergency request by the Standing Rock Sioux Tribe. The motion followed altercations between private security and protesters after pipeline workers allegedly bulldozed areas that the tribe's cultural expert had identified as sacred in court documents the day before. According to a memo leaked to a conservative blogger in North Dakota on Sept. 26, seven state archaeologists inspected the area in question and found no artifacts or human remains. Officials say the memo is only a draft and is part of an on-going investigation. 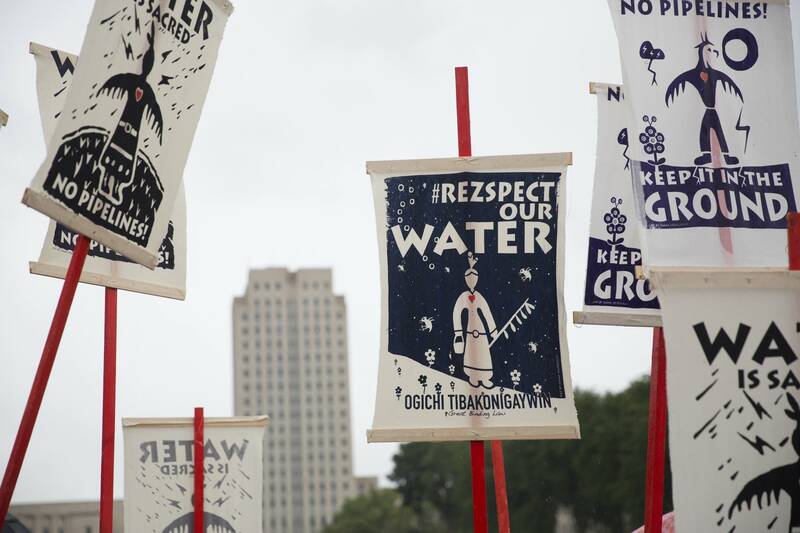 A federal judge rejected a request by the Standing Rock Sioux Tribe to halt construction on Sept. 9, stating that the Corps had followed federal law when approving the pipeline. That same day, the federal government stepped in, ordering work to stop on the segment of the project in question, asking Energy Transfer Partners to "voluntarily pause" action on the area tribal members identified as being culturally significant. On Oct. 10, a federal appeals court gave the go-ahead to resume construction on the section previously halted while it considers an appeal by Standing Rock. However, on Nov. 14 the Corps called for more study of the project as well as more input from the Standing Rock Sioux tribe before deciding whether to approve an easement for the project to cross under Lake Oahe. A move Energy Transfer Partners called "purely political." On Jan. 24, 2017, a few days after his inauguration, President Donald Trump signed executive orders telling the Corps to proceed with the easement. The move was expected. During Trump's transition of power, spokesperson Jason Miller said that the then president-elect supports construction of the pipeline. When construction resumed on Feb. 8, the Cheyenne River Sioux asked a federal judge to stop the Lake Oahe work while a lawsuit filed earlier by the two tribes against the pipeline proceeds. 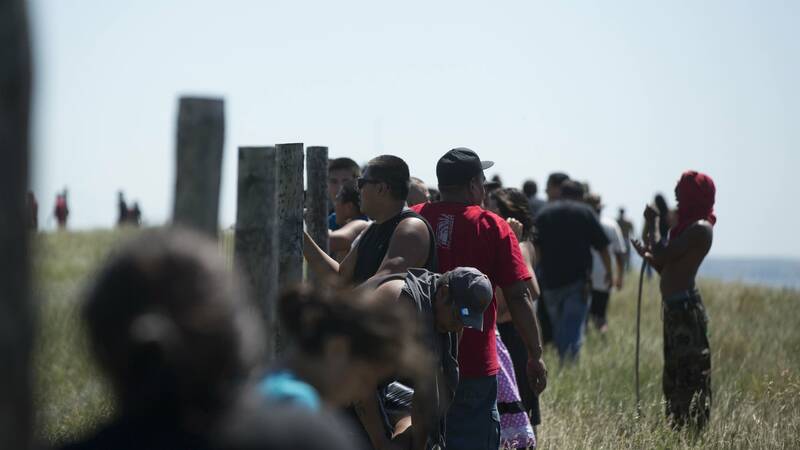 A federal judge rejected that request, saying that as long as the oil isn't flowing through the pipeline, there is no immediate harm to the Cheyenne River and Standing Rock Sioux tribes. Was the Standing Rock Sioux Tribe consulted? Concerns over water safety and cultural site protection are noted in the environmental assessment, which says a "good faith" effort was made to consult tribes, citing meetings with tribal government starting in October 2014. The assessment says Corps officials conducted several government-to-government consultations, recording 250 interactions with Dakota Access representatives and consulting parties, including the North Dakota State Historic Preservation Office, Advisory Council on Historic Preservation and "interested parties" as well as tribal officials. According to the assessment, the Corps' Omaha, Neb., office met with tribal leaders and considered all tribal comments but ultimately made a "no historic properties affected" determination, that the North Dakota Historic Preservation Office concurred with in April. The tribe argues they were not adequately consulted in the historical surveying process. Standing Rock Tribal Chair Dave Archambault II says the government-to-government meetings were one-sided and that the tribe was only consulted near the end of the planning phase, "after their plans were already made." In November, the Corps said it needed more tribal input before deciding on the easement it has since denied the company. The subsequent talks played a role in the decision to block construction, said Assistant Secretary for Civil Works Jo-Ellen Darcy. However, the Corps have since granted permission for construction to continue following an order from President Trump. The majority of the Standing Rock Sioux Tribe's population relies on drinking water from wells downstream from the proposed pipeline route. In the event of a pipeline spill, it is possible that in the first hour enough benzene would be released to exceed safe drinking water standards, according to a 2013 pipeline risk assessment by environmental consultants AECOM. In the environmental assessment, the Corps said any hypothetical spills would likely be too small to release enough benzene to become an issue and added that there would be frequent testing and quality checks performed by Energy Transfer Partners. The assessment also notes that emergency drills would prepare workers and other safeguards, including the ability to close valves remotely within minutes of a detected leak, would help safeguard the tribe's drinking water supply from pollution. If any of these features were to fail, the assessment said the company would take full responsibility for cleanup and providing alternative water sources, including bottled water. According to data from the Federal Pipeline and Hazardous Materials Safety Administration 184,982 barrels of hazardous liquid were spilled from pipelines from 1995 to 2015. Data also show 859 "serious incidents" since 1995 — those in which the spills resulted in a fatality or injury requiring in-patient hospital care. In that same time there have been 5,674 "significant incidents," including "liquid releases resulting in an unintentional fire or explosion." 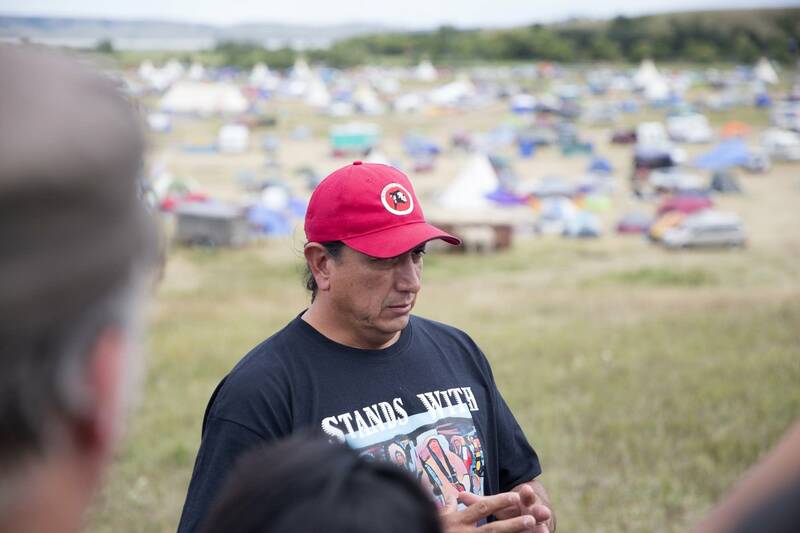 Back in April, a few Standing Rock tribal members set up a protest camp near the proposed construction site in a small valley where the Cannonball River flows into Lake Oahe. Fueled by social media, the protest gained momentum, and the camp is now larger than most small towns in North Dakota. It includes many tribal members from Standing Rock, as well as other Native Americans and nonnatives from around the U.S.
Tribal leaders say they're not looking to start a war. They're focused now on legal action, the regulatory process and civil disobedience. Tom Goldtooth, executive director of the Bemidji, Minn., based Indigenous Environmental Network, sees the tribal engagement in environmental and social issues as a natural progression, building on a return to traditional culture, spirituality and language over the past 15 to 20 years. He says tribal nations at the camp have had some frank discussions. There's not unanimous agreement on tactics and strategy, but there is a commitment to stand together. Tensions escalated in October when law enforcement and National Guard troops attempted to clear protesters near a construction site. Law enforcement officers dressed in riot gear and firing bean bags and pepper spray evicted protesters Oct. 27, from private land in the path of the pipeline, dramatically escalating the months-long dispute. More than 140 protesters were arrested over the weekend of Oct. 28. 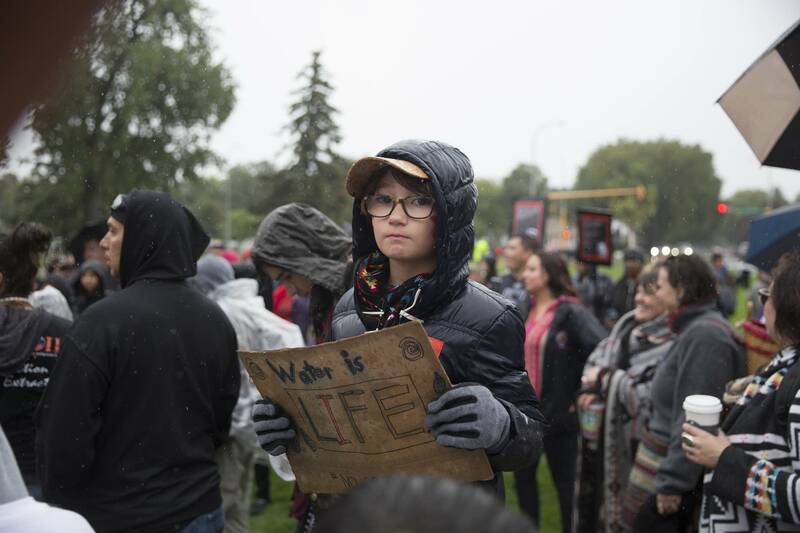 Additional protests have been staged across the nation, including a downtown Minneapolis gathering, calling for Minnesota authorities to withdraw law enforcement help for police forces at the protest. Protesters said they are prepared to stay, winterizing the camp and gathering supplies for the harsh winter months. However, following the announcement that the Corps will not grant permit for construction under Lake Oahe, Archambault has told protesters to leave the camps. "I understand that they're concerned, that it's not over, they can't trust the federal government" but "nothing's going to happen this winter," he told KFGO radio, a Fargo, N.D., station. Since that announcement many have left the camps, but pipeline opponents have vowed to keep fighting its construction in the wake President Trump's orders.